Since our little girl has been mobile, I have been meaning to tackle this project. The shelf in our kitchen was intended to be a functional part of our command center. Instead, my husband piled papers in it and tiny gadgets that he didn't want to find a home for. I was also guilty of stashing items in it that had no home. When Miss. E starting crawling around she would use the shelf to pull herself up and then yank down Hubby's papers, pausing to try and put some of them in her mouth. I knew that the shelf had to go. 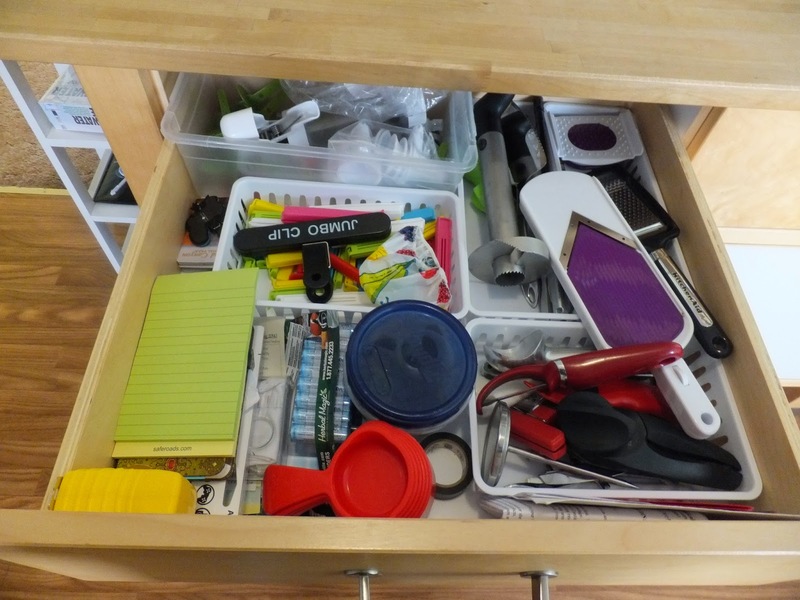 For my minimalism project, I tackled the shelf and I also went through the drawer that doubles as a utensil drawer and part of our command center. Hubby refuses to put his lunch kit and water bottles in a cupboard, so I have to work around that. 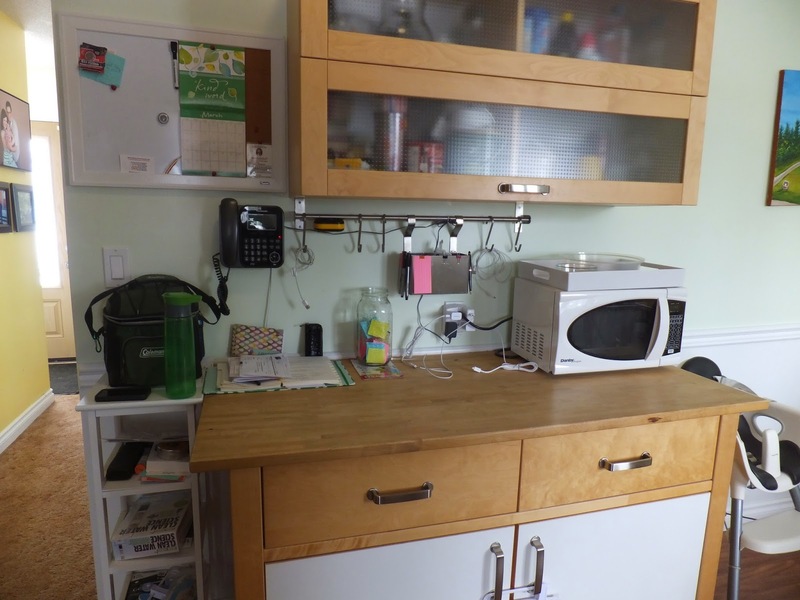 Our command center is part of our tiny kitchen. I stole this shelf from our spare bedroom, where it was acting as an nightstand. We don't have guests often, so I will be able to improvise when we do. 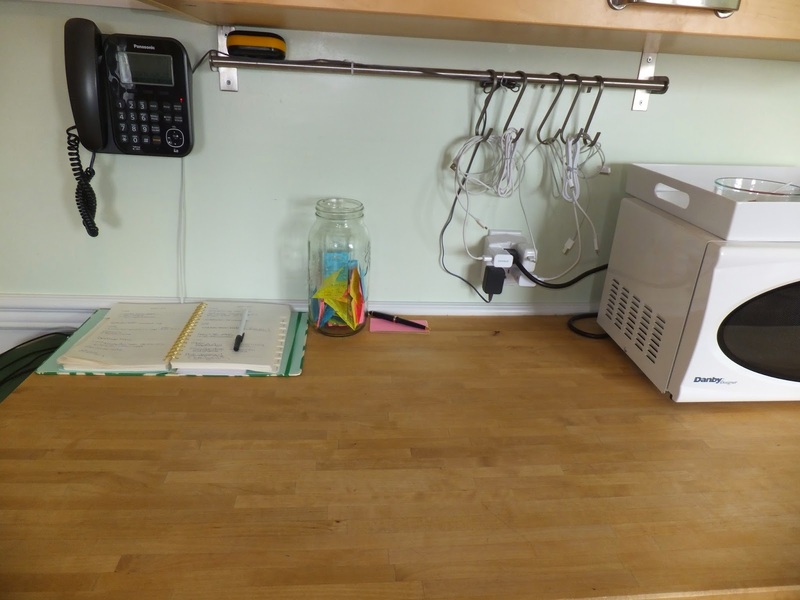 This stand works better in the kitchen/command center because it is only two shelves, so there is less chance of clutter building. If I am feeling ambitious this summer, I might paint it white. 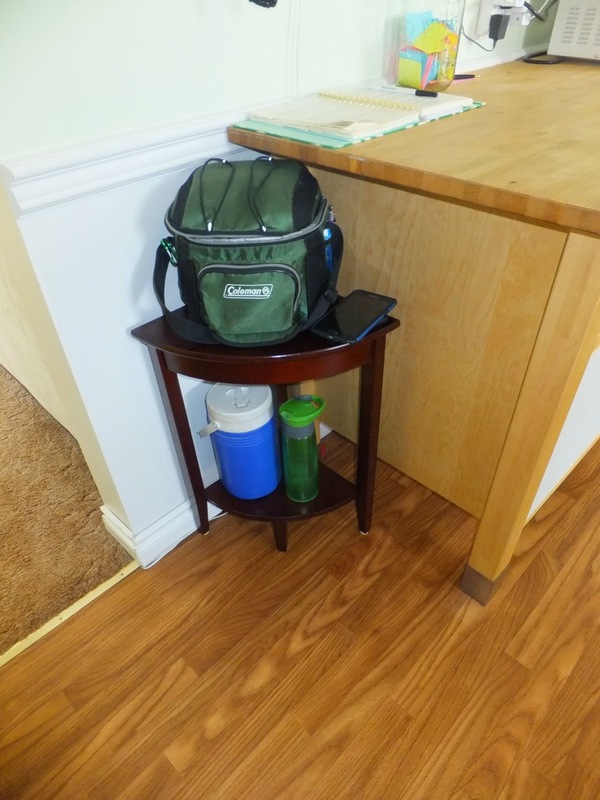 I devoted the shelf to Hubby's lunch kit and water containers. He is happy because it is out and ready to go. I am happy because it is neat and tidy. The old self was cleared out and we sorted the objects into their homes around the house. It is sitting downstairs awaiting a new home. I cleared off the top of the butcher block. I kept my day planner (essential! 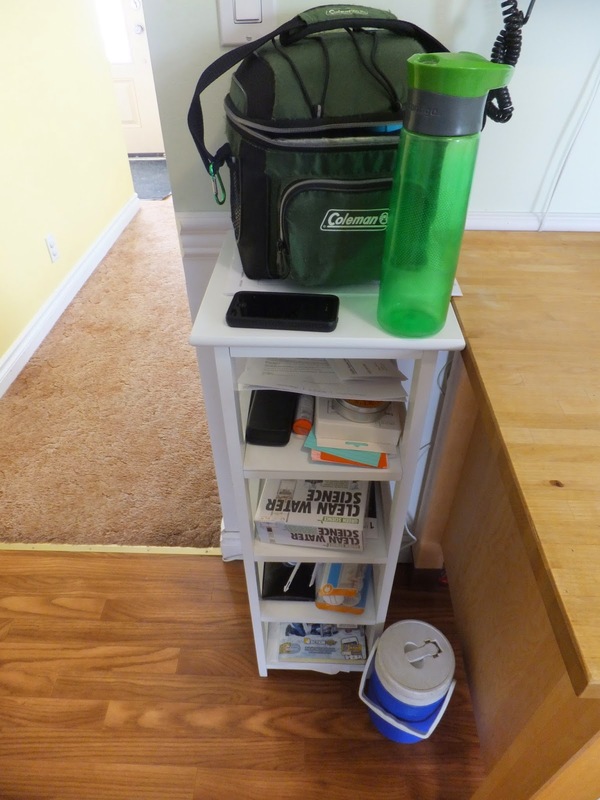 ), our Gratitude jar (Pinterest idea that I LOVED), and our phone/device chargers. I got rid of the hanging silver container because it seems useful, but in actuality it just gathered junk. Each device cord is neatly hung on a hook. 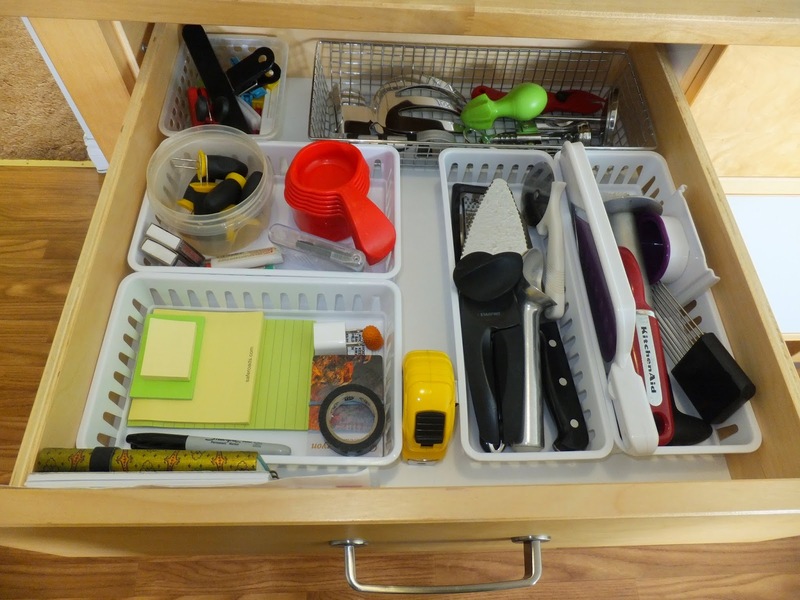 The utensil drawer/command center drawer is much better than before! I cleared everything out and sorted through the utensils. I relocated the packages of batteries to Hubby\s battery drawer. I got rid of a few things that we don't use, including some wine toppers, utensil clips and a broken icing dispenser. I devoted a basket to notepads, pens and other office supplies. I stashed our take out menus vertically in the drawer, along with our address book and garbage tags. It looks much neater and is much more functional.